G4K Alpine Goat Rescue is another point & click escape game developed by Games4King. There was a huge palace in a beautiful and magnificent forest. The palace was beautiful to see. One of the alpine goats lives in that forest. One day, that alpine goat got unexpectedly stuck in the palace. It is your duty to rescue the alpine goat. 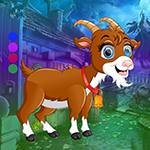 It will help you to find the hidden clues in the form of colours and numbers and to find the items where the alpine goat is to save the animal. Find them all and solve all puzzles to free the alpine goat. Good luck and have fun! Trouble right from the start. The purple faces won't stick where they're supposed to. Everything fits where it's supposed to, good game. Great escape, and rather easy.